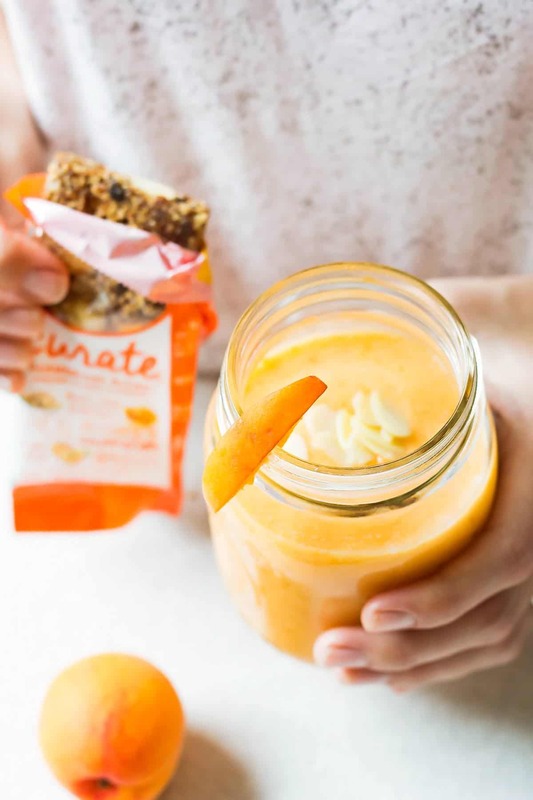 This refreshing Apricot Almond Milk Smoothie is inspired by Curate’s Harmonious Blend snack bar. 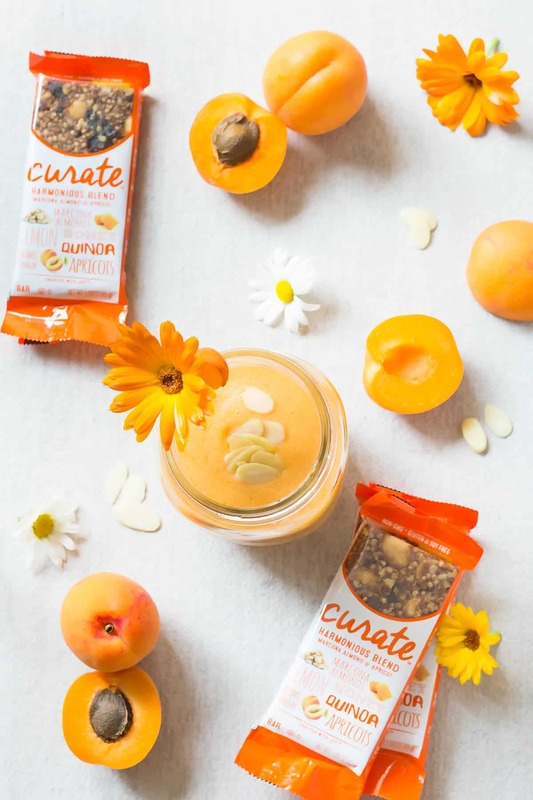 Sweet tart apricots are paired with protein-rich almonds and sweetened with a touch of honey. You might think that as a work-from-home mom I have lots of time to prepare cute, thought-out snacks and lunches for Olivia and myself. However, most days are a whirlwind of making sure a particular someone is and stays dressed, emails, photo shoots, nap time fights, more emails, ring-around-the-rosies, photo editing, play dough art and more fun of this sort. Needless to say, quick yet nutritious snacks are always welcome in our house. Especially when they come in fun and exciting flavors. Luckily, Olivia is very easy going and loves her smoothies just as much, if not more than her mommy. Smoothie lunches are not a rare occurrence for us. But I still like to have something solid with my liquid meal. Wholesome snack bars are just right for that. My most recent wholesome snack discovery are Curate bars. Made from fruit, nuts, and grains their bars are non-GMO, gluten-free, and contain no artificial flavors, colors, or preservatives. I say a big fat YES! to all of that. 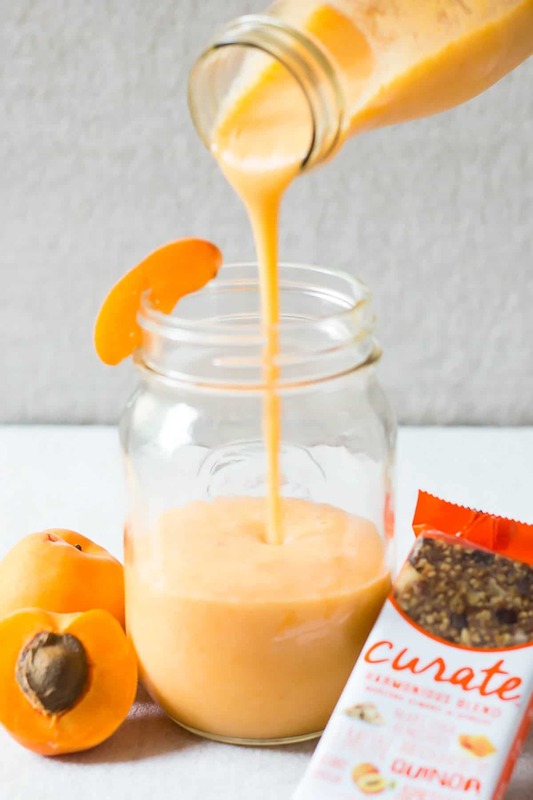 For today’s smoothie recipe I’ve partnered with Curate and took flavor inspiration from the awesome combination of their Harmonious Blend bar. It features soft and sweet apricots with a little zest from lemons, marcona almonds and quinoa for protein and fiber. A touch of honey and balsamic vinegar to round out the flavors. We have spent the last month visiting with my family in the beautiful Okanagan Valley which is known for it’s abundant fruit orchards. Very fittingly the stone fruit is starting to ripen. We’ve fully indulged on juicy sweet cherries in the last few weeks and local apricots have just started to become available as well. Now you know why I felt so inspired by the apricot bar. 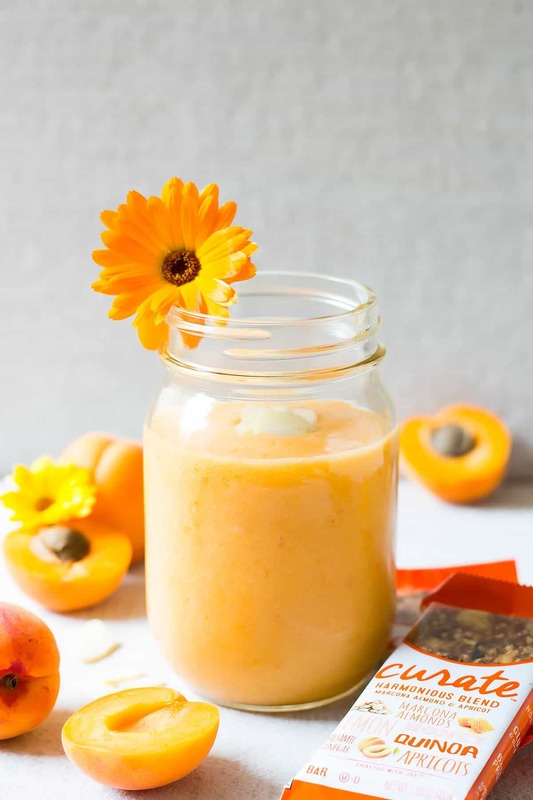 For the smoothie combined the sweet local apricots with almond milk. While the bars use lemons for a little zest, I chose frozen pineapple chunks for a little tropical ‘zesty’ sweetness. I also love to use at least one frozen fruit in my smoothies to make them cold and a little thicker. Finally, raw local honey (my parent’s friends in Kelowna are beekeepers) and coconut oil add sweetness and boost the nutritional value of the smoothie. Be sure to follow my tip in the recipe below on avoiding coconut clumps in your smoothie. One more little tip about the apricots. 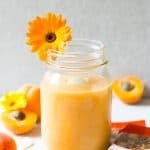 If you aren’t getting sweet ripe fruit from the orchard, make sure that you let your store-bought apricots ripen on the counter for a few days. Even better if they get some sunlight. This will make the apricots softer, sweeter and just so much more flavorful. 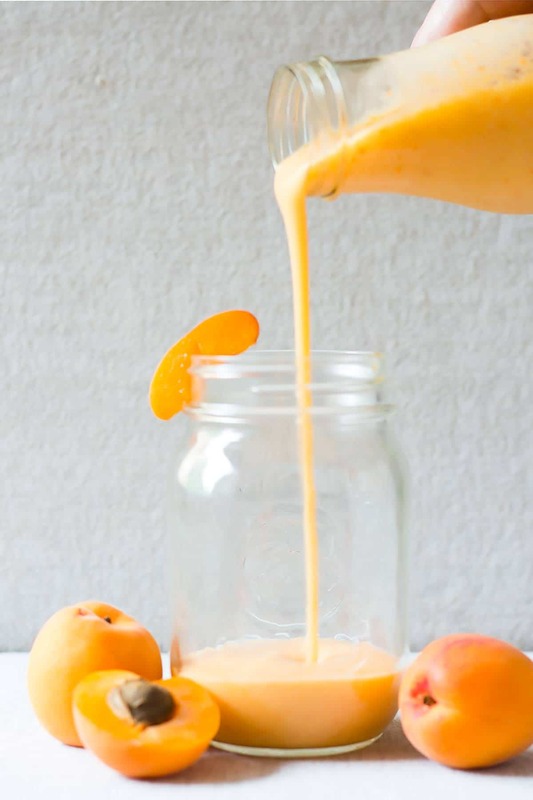 Remove the pits from the apricots and add to a blender together with pineapple, almond milk, and honey. Blend until smooth. While the blender is running, add the melted coconut oil in a steady stream, this way you’ll avoid it clumping in your smoothie. Add baby spinach, if you’d rather have a green smoothie without affecting the awesome flavor combination. In case you are looking for the best blender for smoothies, check out this comprehensive guide to learn what to look for to find the best smoothie blender for you. I also included a detailed review of my 6 favorite blenders. Thank you to Curate Snacks for sponsoring this post. All opinions are as always my own. We just got back from Sicamous and I was all. over. the. fruit. stands. I love love love this time of year! This smoothie looks absolutely delicious, and is so pretty, too! Too funny, I just wrote about Sicamous in my road trip post. You don’t go houseboating by any change? And thank you! Not sure if you noticed (may be super obvious), but I totally took inspiration from your green smoothie for a few of the shots. Thank you so so much Laura! They are just in season here but I guess you are on opposite schedule? Absolutely! This smoothie will keep you full for a while with it’s protein. This smoothie looks refreshing and delicious! This sounds incredibly simple and refreshing! I’d love to make this on a hot summer morning! 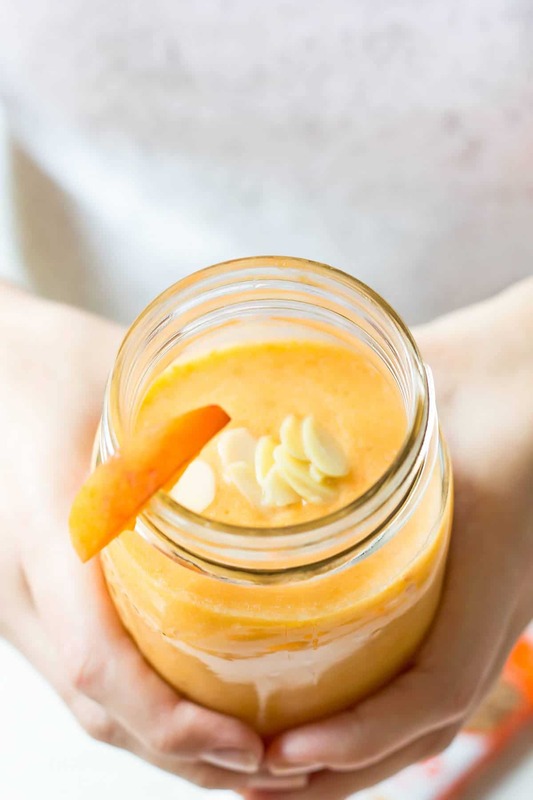 Love fresh apricots and almond milk used in this smoothie! Thanks a bunch Jessica! Yes this is so so perfect for breakfast too. Thank you Aish. Yes it is! Love the sound of this smoothie! Pretty pictures too! Somedays I am so busy with the baby, blog, photographing, that it’s hard for me to get a lunch made. I love quick things like smoothies! Totally agree, on my day to day list of things to do, making lunch has very low priority. This smoothie looks divine. Apricot season is already here so I am surely making this. Thanks for the recipe! Oh yum! I love smoothies and I cannot wait to try this one! Yum!